A NEW YORK TIMES BESTSELLER • A Telegraph Book of the Year • A New York Times Notable Book of the Year • A Washington Post Book of the Year • A Wall Street Journal Book of the Year • A Slate Book of the Year ‘Probably Chabon’s greatest, a piece of sustained writing that will be hard to see outdone in 2017’ The Times ‘Entirely sure footed, propulsive, the work of a master at his very best. 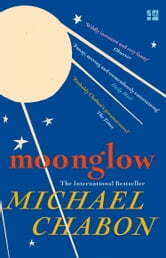 The brilliance of Moonglow stands as a strident defence of the form itself, a bravura demonstration of the endless mutability and versatility of the novel’ Observer ‘The world, like the Tower of Babel or my grandmother’s deck of cards, was made out of stories, and it was always on the verge of collapse.’ Moonglow unfolds as a deathbed confession. An old man, his tongue loosened by powerful painkillers, his memory stirred by the imminence of death, tells stories to his grandson, uncovering bits and pieces of a history long buried. Why did he try to strangle a former business partner with a telephone cord? What was he thinking when he and a buddy set explosives on a bridge in Washington, D.C.? What did he feel while he hunted down Wernher von Braun in Germany? And what did he see in the young girl he met in Baltimore after returning home from the war? From the Jewish slums of pre-war Philadelphia to the invasion of Germany, from a Florida retirement village to the penal utopia of a New York prison, from the heyday of the space programme to the twilight of ‘the American Century’, Moonglow collapses an era into a single life and a lifetime into a single week.